It takes a lot of time to choose the perfect pair of eyeglasses. First, you need an examination at Florida Eye for a prescription. Then you need to choose a frame that suits your face and your style. After that, you must wait for that call telling you your new glasses are ready for you. There are a lot of ways to clean a pair of glasses. Unfortunately, most of those methods are wrong. Don’t use a paper product to clean the lenses, including tissues, toilet paper, or napkins. Paper is made from a pulp that could be sourced from wood, grasses or rags. No matter how soft it feels on your skin, it contains tiny fibers that can scratch your glasses, especially when you habitually use tissues, etc. for cleaning. Don’t use your shirt. Unless your shirt is clean and 100% cotton, the fabric could contain fibers or dirt that can scratch the lenses. Don’t use vinegar, toothpaste, window cleaner, ammonia or lemon juice, as they can damage any coatings on your lenses. With all the “don’ts” out of the way, cleaning your glasses isn’t hard at all. It’s just knowing what to use. There are two methods, either is fine. Using a lotion-free soap or dishwashing liquid, such as original Dawn, wash your hands thoroughly to remove any grime or oils that could be transferred to the lenses. Rinse eyeglasses under lukewarm tap water. Put a drop or two of cleaner on finger – you don’t need much. Rub soapy finger gently over all parts of the frame and both sides of the lenses. 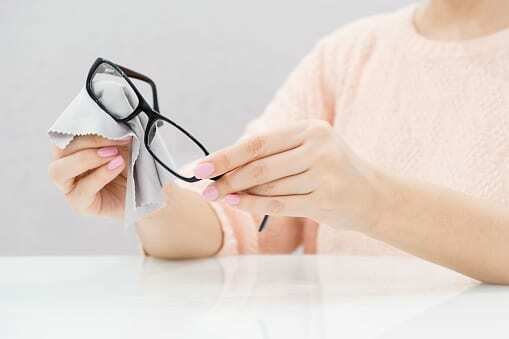 Carefully dry glasses with a clean lint-free towel, such as a cotton dish towel, that wasn’t washed with fabric softener or dried with a dryer sheet as they contain products that can smear the lens. Inspect to be sure no smears remain. That’s it. Probably took you longer to read this than it would have taken to safely clean your eyeglasses. Eyeglass manufacturers generally recommend this method, and this is how professionals clean a pair of eyeglasses. It’s easy to keep the cleaner and cloth in your desk at work or to take it with you when you travel. Before spraying on the cleaner, blow on both sides of the lenses to remove anything that could leave a scratch. If your eyeglasses have an anti-reflective (AR) coating, be sure the eyeglass cleaner is approved for coated lenses. Microfiber cleaning cloths dry lenses very well. Unlike most fabrics, they trap skin oils that could smear the lens. Handwash the cloths frequently using a lotion-free dishwashing liquid such as original Dawn. Air dry. Eyeglass wipes are handy for touchup cleaning. Unfortunately, once your lenses are scratched, they’re scratched. There’s no magic treatment that will remove the scratches. There are a few products on the market that make scratches less visible. Essentially, these are waxy substances that aren’t very durable and wear off fairly easily. If your glasses have an anti-reflective coating, don’t use any of these products as they could smear the lens. Choosing a scratch-resistant coating is a great option when buying a new pair at Florida Eye, especially if you’ve had a problem with scratches in the past. Using an eyeglass case is by far the safest way to extend the life of your eyeglasses. A hard-shell case is best, but a soft case is certainly better than nothing. Dropping unprotected eyeglasses into a pocketbook or pocket makes it very easy for them to be accidentally damaged or for the lenses to be scratched. We hope you’ll enjoy wearing your new eyeglasses for a long time. Of course, if you notice any changes in your vision or experience any eye problems, call Florida Eye for an appointment. Your vision is too valuable to let any problem linger and perhaps worsen.